When Shiner Died is the story of a family peta yellow labthat died. It's a children's book about pet loss and grieving the death of a beloved animal. Two members of Shiner's adopted family tell the story. They are Maggie Roxanne and Luke Zamzow Hauder, ages 6 and 4. When Shiner Died will almost certainly bring tears to adult eyes, and children will identify with the story, as told by their peers. The author of the book, Rebecca S. Hauder, is a Registered Nurse, 25-year grief therapist, and grandmother of the two storytellers. She is also the author of The Nature of Grief: Photographs and Words for Reflection and Healing, the Grief Support Mailings, the Grief Support Group Manual, and numerous articles related to grief and loss. Apart from the story of Shiner's death, the book contains several pages for young readers to share about their pet, and suggestions for adults in helping children following the loss of a pet. 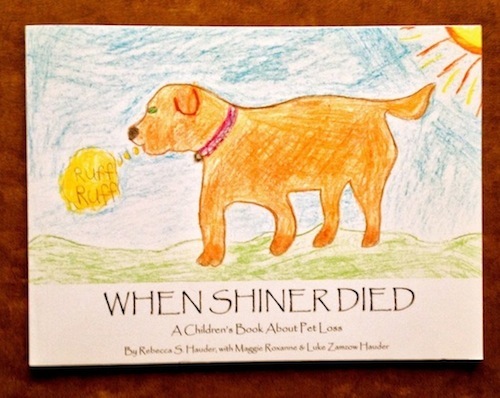 When Shiner Died will make a wonderful resource for a child, or an adult, who recently lost their pet. "When Shiner Died is age-appropriate for my 2nd and 3rd graders. I found myself moved to tears while reading it. Great job!" --Leah, 3rd grade teacher, Madras, Oregon. "We're going to order another "Shiner" book. We just reread ours to see if it would be appropriate for our friends in Alabama who lost their dog. It's absolutely perfect for them too." "Thank you so much for the books. They are really exceptional. The children's book is so easy for kids to identify with. It is simple, direct, and personal. And the suggestions are spot-on (from what I've experienced with kids). I so much admire that you did this-you have a real gift! Thanks so much for sharing."